The Grant Area District Library is located right in the heart of the school campus, just a couple minute walk from any of the schools. 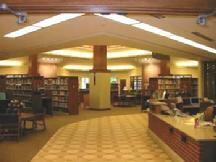 By clicking on the photo above, you will link to the Library's website. The Grant Area District Library was established as a district library on December 4, 2000 by agreement between the City of Grant, the Township of Grant, the Township of Ashland, and the Grant Public Schools (according to MCL 397.171 et seq.). It was formerly established as the Grant Public Library on June 7, 1927. The mission of the Grant Area District Library is to provide quality materials and services that allow and encourage access to information that meets the educational, cultural, and recreational needs of the community in an atmosphere that is both welcoming and professional. Meetings: 3rd Tuesday of every month at 7pm at 122 Elder Ave.